Little has been written about the military role of African Americans in military campaigns of the United States despite the fact that men and women of color were involved in all national conflicts beginning with the Revolutionary War. Indeed, the thought of black men and women serving the Confederacy during the Civil War is difficult for some to believe because it appears to be a paradox. Yet the surviving narratives, writings of Civil War veterans and their family members, county histories, newspaper articles, personal correspondence, and recorded tributes to black Confederates, offer heartfelt sentiments and historical information that cannot be ignored—and demonstrate that they did serve the Confederacy as soldiers, bodyguards, sailors, construction workers, cooks, and teamsters. This 35 x 26-inch full-color poster serves as a quick reference and study guide for the classroom or for anyone with an interest in Confederate history. 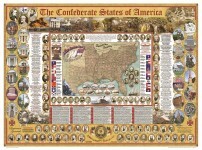 In addition to its centrally placed map of the Confederate states, it includes photos of all eight Confederate full generals, all seventeen lieutenant generals, eighteen major and brigadier generals, eight members of the presidential cabinet, and twenty-five important Confederate sites that can be visited today. Confederate Women is an inspiring anthology of ten essays about the crucial role these women played during and after the Civil War. These heroines stuck to the belief that the Civil War was “certainly ours as well as that of the men.” Excerpts from correspondence with their sons, fathers, husbands, and other women compatriots provide us with their invaluable wisdom, thoughts, and frustrations, while shedding light on their unique position in America’s past. Paperback. Harpers Ferry is a tenacious town; battered and muddied by water and war, it refuses to quit. The site of John Brown’s infamous raid, which brought what the author considers the first shots of the Civil War, Harpers Ferry also has stood floods, plague, invasion, assault, cannon fire, the Depression, Prohibition, and just plain bad luck. Despite having had far more than its share of disasters, this small West Virginia hamlet survives. Christmas has come to the mountain country of Appalachia in a delightful new version of the classic holiday verse by Clement Moore. James Rice, illustrator of the bestselling Cajun Night Before Christmas, has teamed up with Thomas Noel Turner, a long-time resident of the Appalachian region and professor of education at the University of Tennessee, to add winsome dimension to the enchanting tale. William Miller Owen served as first lieutenant and adjutant of the Battalion Washington Artillery of New Orleans. Realizing at the time of his service the importance of an accurate, objective account of his exploits, Owen set out to keep a record of the events up until the surrender of General Lee. Later, using his own diary as a starting point, he compiled a manuscript for publication. This is his account. Paperback. Through the 31 line illustrations and brief historical narrative, children are able to follow the life of Jefferson Davis from Rosemont, his boyhood home in Woodville, Mississippi, to his marriage to Virginia Howell. This book describes his terms as a member of the House of Representatives and Senate, and his role in the drama of the Civil War as president of the Confederacy. The daring exploits of Frank and Jesse James have fascinated America for more than a century. Myth and fact have meshed together to create a legend of monumental proportions. Paperback. A comprehensive description of the events that led to the climax and eventual demise of the British campaigns in the Southern theater during the Revolutionary War. This almost forgotten campaign and its trilogy of intense clashes at Guilford Court House, Cowpens, and Kings Mountain proved pivotal to American independence.